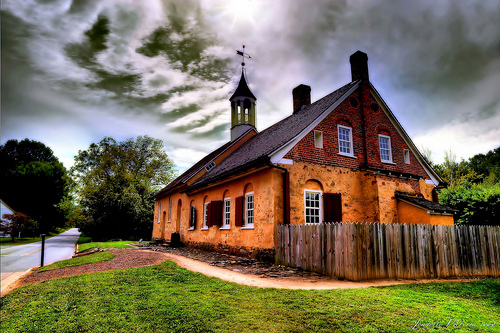 Moravians are members of a church —officially called the Unitas Fratrum, or Unity of Brethren—that, by the time of their arrival in North Carolina in the middle of the eighteenth century, had already seen almost three centuries of rich religious life. They are spiritual descendants of the Czech priest Jan Hus, who for his attempts at reform was martyred in 1415. In 1457 some of his followers founded a church body consecrated to following Christ in simplicity and a life dedicated to God. This new church developed a productive and orderly ecclesiastical life in the fifteenth and sixteenth centuries. By 1732 the Moravian Church began sending missionaries from Herrnhut to all corners of the world. After establishing themselves in England, the Moravians sent colonists to America in 1735, but this initial settlement, in Georgia, proved unsuccessful, partly because of disruptions caused by war between Protestant England and Catholic Spain to the south in Florida. The Moravians established themselves more permanently in Pennsylvania in 1741, with the town of Bethlehem as their chief center. In part to facilitate the Moravians’ settlement in the New World, the British Parliament in 1749 recognized the Moravian Church as ‘‘an ancient Protestant Episcopal Church.’’ That vote of approbation brought several offers by English noblemen seeking solid, hard-working settlers for their lands in various parts of theworld, including an offer by John Lord Carteret, second Earl Granville, who had chosen to retain his holdings in Carolina after the other Lords Proprietors had surrendered their lands to the Crown in 1729. A survey expedition was sent to North Carolina late in 1752, and a tract of nearly 100,000 acres, subsequently named Wachovia, was selected as the site for a new Moravian settlement. The first settlers arrived in November 1753. Over the next dozen years, this initial community (Bethabara) gave rise to four others (Bethania, Salem, Friedberg, and Friedland), in what is now Forsyth County. From the very beginning, the Moravians kept and preserved meticulous records of their church, community, and commercial life. Along with this emphasis on record keeping, the Moravians maintained active communication with other Moravian centers in Europe and throughout theworld. This dedication to sharing and receiving information continues today throughout the worldwide Moravian Unity. During the American Revolution the Moravians were officially neutral, which caused them to be viewed with suspicion by those seeking independence and those loyal to the king alike. The North Carolina legislature, however, continued the Moravians’ exemption from bearing arms and confirmed the title to their land, which had been threatened with confiscation. At the close of the conflict, the Moravians held the only known official celebration in obedience to Governor Alexander Martin’s proclamation that 4 July 1783 should be observed as a day of thanksgiving for the return of peace. Once independence was won, the Moravians quickly affirmed their allegiance to the new state and national governments. Increasing experience with ‘‘American freedom’’ also encouraged North Carolina Moravians to seek more independence from their church’s centralized authorities in Germany and led individual members to call for less church regulation of marriages and the trades. The Moravian communities, especially Salem, had developed into major trade and commercial centers in the western part of the state. They had also developed a rich cultural life, especially in their music. Education was important to the Moravians. From the beginning, their first settlements provided schools for both boys and girls. In Salem, their central administrative center, the boys’ school, throughout the nineteenth century and into the opening decade of the twentieth, educated local youths, including many non-Moravians who offered valuable contributions to the state. A local girls’ school was begun in 1772, and in 1804 a girls’ boarding school, the Salem Female Academy, was added, attracting young women from throughout the South. This institution continues today as Salem Academy and College. As part of the worldwide Moravian Church, North Carolina Moravians have helped support that denomination’s extensive missionary work in Greenland, the Caribbean, and southern Africa. They also had direct responsibility for a mission to the Cherokee in northern Georgia, begun in 1802. This mission followed the Cherokee to Oklahoma after the Trail of Tears in 1838. An abortive mission to African slaves in northern Florida was also begun in 1847. Closer to home, work among African Americans around Salem led to the establishment of a congregation for them in 1822. A new building, erected in 1860 and used until the 1950s, is believed to be the oldest surviving African American house of worship in North Carolina. For more than a century after the Moravians’ initial settlements in North Carolina, all their civic and commercial activities were under the direct control of the church; thus their early records document not only ecclesiastical concerns, but the total life of the community and its relation to its neighbors. Control of trades in Salem was given up in the 1840s, and land was provided north of Salem for Winston, the seat of the new county of Forsyth, in 1849. Salem itself was incorporated with a secular town administration in 1857. By the time of the Civil War, the Moravians had lost their exemption from military service. Many of them served in the Confederate army, and several of them formed the musical bands of local regiments. The best known of these is the 26th North Carolina Regiment band, though Moravians served as band members in the 11th and other regiments also. In Salem, the Fries Woolen Mill provided cloth for many of the uniforms worn by North Carolina troops throughout the war. In 1877 Edward Rondthaler (made a bishop in 1891) arrived in North Carolina to provide more than 50 years of leadership in rebuilding and expanding the church’s life and work. Several new congregations were established, and the Moravians emerged as a small but ‘‘mainstream’’ denomination in America, though ties with the worldwide Moravian Church remained intact. Throughout the twentieth century the Moravian Church in North Carolina cooperated with other denominations in ecumenical discussions and joint programming in response to the needs of the day. At the same time, it expanded to have congregations in many of the major cities of North Carolina, and new churches were established in Virginia, Georgia, and Florida as part of the Southern Province of the Moravian Church. Total membership in North Carolina at the beginning of the twenty-first century stood at just over 20,000. J. H. Clewell, History of Wachovia in North Carolina (1902). C. Daniel Crews, My Name Shall Be There: The Founding of Salem (1995). Crews, Through Fiery Trials: Moravians and the Revolution (1996). Crews, Villages of the Lord: The Moravians Come to Carolina (1995). Adelaide L. Fries and others, eds., Records of the Moravians in North Carolina (11 vols., 1922-68). Kenneth G. Hamilton, History of the Moravian Church (1967). The 1788 Gemeinhaus in Historic Bethabara Park. Image courtesy of Flickr user Jeanette Runyon. Available from http://www.flickr.com/photos/jeanettevictoria/3975178583/ (accessed September 17, 2012).